From the end of September through most of November, I catch more fish on spoons than any other lure. Fall is my most consistent time to fish deep water, and heavy spoons get to the bottom quickly and find out what is down there. The nice thing about spoons is that virtually any species of fish will bite them. So, if you are seeing fish on your graph and can't tell what species they are, you can drop a spoon down and find out. I've caught largemouth bass, white bass, yellow bass, carp, gar, crappie, bluegill, bowfin, and probably other species that don't come to mind on them. They usually bite them quickly, so I often get bit on the very first drop with spoons. If you aren't familiar with the spoons I am speaking of, they are normally heavy and shaped like one end of a spoon. Some resemble the first inch or two of the handle of a spoon, while some are more like the scoop of the spoon. Others are somewhere in between. Most are made out of lead, but I have also done well on spoons made of chrome and stainless steel. They primarily resemble shad, but some manufacturers design them to resemble gamefish. I know firsthand that spoons are very effective on Lake Fork. But when I look at the Insider BASSlog database, I see that spoons are not fished much in other lakes. I don't know if that is because they aren't effective or they just don't get used. They are definitely no secret on Lake Fork. Most of the guides fish them and many of the touring pros fish them when they come to Lake Fork. The reason they are so effective on Lake Fork is that there are plenty of shad, which they are designed to resemble. Also, Lake Fork has tons of roadbeds and humps that don't have too much cover to fish them. Most spoons have exposed treble hooks, so they tend to hang anything that comes in their path. Spoons aren't very good baits to fish in heavy cover. On a positive note, they are very easy to unhang, assuming you don't dig the hooks in too far or catch braided line or anchor rope. My expertise is on Lake Fork and the surrounding lakes, so I seldom fish other lakes. However, I would certainly fish jigging spoons on any lake that has humps that are at least 15 feet deep on top and have at least 30 feet of water around them, assuming I find fish on my graph. The best case scenario for spoons is when the fish are at the top of the hump. This often means that the bass have the bait surrounded and they will use the top of the hump as an ambush point. Sometimes the fish will bite spoons on the slope, and occasionally they will bite at the bottom of the hump, but the top of the hump will usually have more active fish if they are present. According to the BASSlog, the best colors are pearl, white or silver (best resembling shad). The best time to use them is mid-day. 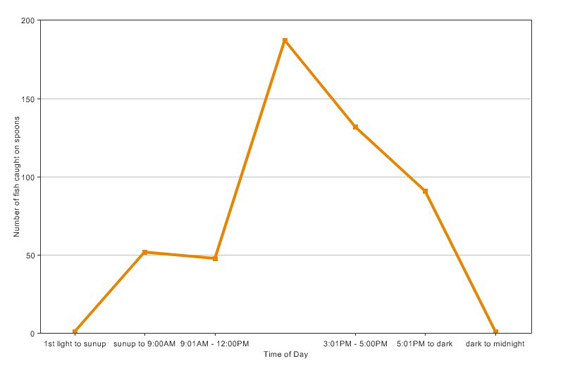 Below is a graph that shows most fish being caught around noon to 5 p.m. I was a bit surprised to see such an overwhelming majority during that time. I will often get into the best action just after sunup or just before sundown. So don't rule out the early and late periods of the day for using spoons. The BASSlog shows fish recorded on spoons for every month of the year. The best months are the fall months (September, October and November). The worst months (months with the least amount of posts) were the spring months. This is not surprising since most people are in the coves fishing shallow water. The best depth recorded is 21 to 25 feet, but there were almost as many fish recorded over 30 feet deep. The best structure is some type of hump, point, or roadbed with very little cover. As for spoon size, I was surprised to see that spoons over 1 ounce had the overwhelming majority of fish recorded. I catch a ton on 1/2-ounce spoons, so I expected it to have the most posts. The best time for spoons is right now here in Texas. During my last two trips, we caught largemouth bass over 7 pounds on spoons. If you are in the Northern states, that pattern may be coming to an end. Once the water temps dip below 60 degrees, the fish won't be near as active. I will often find fish on the graph, drop a spoon down, and not get bit. If that happens, you have to really slow down or switch to a different pattern. That can be frustrating when you were doing so well just a few days before. Get out and fish a spoon before it gets too cold. Good luck!